George Walker Bush the Lesser, Emperor-Aspiring of the Known Universe, Decider, Defender of Democracy, Liberator, Light of Lights, Overmind Most Powerful, etc. etc. visited Albania this weekend. It's one of the few corners of the world where he is not reviled, mostly because Imperial troops (albeit under his predecessor) occupied the Serbian province of Kosovo eight years ago and made it safe for Albanian ethnic cleansing. In fact, His Glorious Serendipity's visit to Tirana fell on the 8th anniversary of the armistice that ended the 1999 invasion. “You get your diplomats working with Russians and EU diplomats to see if there is not a common ground,” said Bush, indicating that if there no compromise on Kosovo’s independence the US may act on its own toward the region. “If you end up being in a position where you don’t, at some point of time, sooner rather than later, you got to say: that’s enough – Kosovo is independent,” said Bush. Commenting on this pronouncement by His Hegemonic Enormity, Serbian Prime Minister Kostunica said that the Empire "has a right to support certain states and peoples in accordance with its interests, but not by making them a present of something which doesn't belong to it... The U.S. has to find some way of showing its favor and love for the Albanians other than presenting them with Serbian territories." Leaving aside for the moment the question of whether Albania and the Albanians have done anything to deserve Imperial favor and love (ha! ), Kostunica has a point here. Even His Most Worshipful Greatness cannot give away what is not his (occupation does not mean ownership, see), so Kosovo is right out. However, he could reward his Albanian vassals with the State of New Jersey. From what I hear, it would not be all that hard. I'm looking forward to an update on AntiWar.com due to these august "pronouncements" by the dear leader. Couldn't imagine you wouldn't reply to this. The NATO attack on Serbia was the final nail that drove me into the Libertarian camp. For others I'm sure it was something all together different but for me it finally laid bare the lie that is American imperialism. 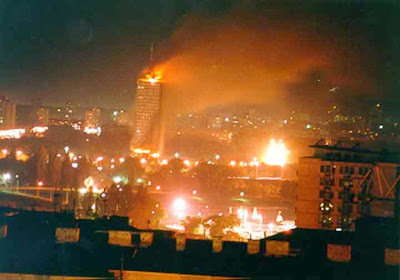 Lets hope that Russia will not sell out the Serbians yet again, like Yeltsin, and that further bloodshed may be avoided. I've played with the thought of making a full column out of this, but it's simply too ridiculous to take seriously. After Russia just about overtly said "No", for the Emperor and his coterie to insist on it in this manner makes them look like petulant children. Of course, given that most of the world considers them war criminals and mass murderers, that's hardly something to fret over.